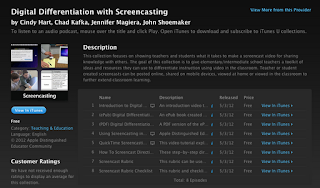 Last summer, as part of the Apple Distinguished Educator summer institute, Chad Kafka, Cindy Hart, John Shoemaker and I spent many hours creating an iTunes U collection about digital differentiation with screencasting. It was finally published yesterday! This collection will teach you how to leverage screencasting for flipping your classroom, student creation, and differentiation. There are video guides, ePubs and PDF how-tos. Tip: Download #2 - the ePub (iBook) - on your mobile device (iPhone, iPad, iPod). It contains all of the text, videos and PDFs in the course. It also has a helpful video we made (not shown in the episode listing on iTunes) that gives you a guide for how to implement this in your classroom. Please take a look - it's free! We'd be so grateful for a 5-star rating! Thanks everyone! P.S. Please disregard my goofy eyes as I read the teleprompter at the beginning of one video... I need to practice how to not look cross eyed while doing that :). That's awesome! I teach with Chad and he is really an amazing tech coach. We are so lucky to have him. Congrats! So proud of your work! You are an inspiration to all!